This spring break, my family and I had the opportunity to visit the Titanic Museum Attraction in Pigeon Forge, TN. The museum isn't hard to find--it really stands out. After all, how can you miss an enormous 30,000 square foot ship-like building as you enter the Parkway in Pigeon Forge? As I mentioned, the exhibit itself looks like the Titanic boat in the middle of a parking lot (although this recreation is only half the size of the authentic Titanic). As we entered the exhibit, courteous staff dressed in uniform handed us boarding passes. These boarding passes included the name and brief background information for an actual passenger of the Titanic. Adults were given adult passengers and children were given children passengers. The boarding card encouraged visitors to find out more about their passenger throughout the exhibit. The children's boarding passes had scratch off trivia questions. Children were also given a souvenir button with their name on it. As we entered the "ship", we were warmly greeted by the ship staff, who proceeded to hand us audio devices and instructed us on how to use. There are two audio tracks throughout the museum, one for adults and one for children. These devices were very easy to use. As we went through the museum, we simply entered the number on the wall for the exhibit we were looking at to listen to the audio. 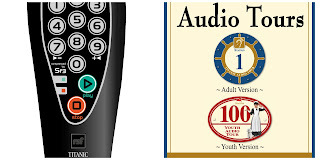 Children had a different number, but I noticed my girls listened to both the children's and the adult audio many times. The tour itself consisted of information about the Titanic, photos and newspaper articles, letters from passengers, as well as artifacts that were recovered from passengers or the sea during rescue efforts. We saw replicas of the ship, of passenger cabins and of the grand staircase. We also enjoyed an exhibit featuring the stars, costumes and more from the Titanic Movie. My children enjoyed interactive features, such as touching a real iceberg, feeling how cold the water was that night, attempting to climb up the deck as the ship was sinking, climbing into a lifeboat and trying to steer the ship away from the iceberg in time. They also really enjoyed their characters from their passport and were eager to seek out more information about them throughout the museum. New this year to the museum is the Discover the 133 Children Stories of the Titanic. This is really an incredible museum! I have to be honest, years ago when my husband and I first saw the Titanic, we rolled our eyes and thought it was some kind of tourist trap like so many things in Pigeon Forge. At that time, we weren't aware that it is an actual museum. Upon learning that it was a museum complete with artifacts from the Titanic, we were interested. However, neither of us expected that it would be as well done as it is. It is informative, humanistic and educational. We loved that our children were so actively engaged that we had time to enjoy the exhibit without being pulled along by them because they were bored. I especially loved the personal aspect of the tour--the stories and lives of those who traveled abroad the majestic ship. I feel that they really live up to their mission statement, "To serve as a historical, humanitarian and educational facility that pays tribute to the memory of all those who sailed on Titanic." This video will give you a bit more of the feel of the Titanic Museum. Personally, I feel this museum is worth every penny they charge. Ticket prices are very reasonable for what this museum offers. The museum is open daily. Hours vary. Contact the museum. Reservations are recommended, especially during peak season. The tour takes approximately two hours, but more could easily be spent if you enjoy stopping and reading everything. Photographs are not allowed in the museum, but there are areas outside for pictures. They offer homeschooling discount days and the website has great homeschooling and other educational material for all subjects. You may get a discount by purchasing combo tickets with other area attractions--see HERE for more details. They have a wonderful gift shop (loved all the Titanic books they have there!) and you can get discount coupons in local coupon magazines or text ICEBERG to 62447. You can also text TITANIC to 62447 for specials and information. I don't know I can say enough about how much we all enjoyed this museum. It is a great way to spend a couple hours in Pigeon Forge that won't make your brain turn to mush, that's for sure! 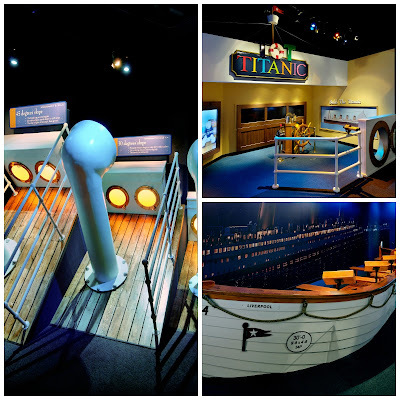 Please visit http://www.titanicpigeonforge.com/ for more information. Disclosure: I received complimentary tickets in exchange for my honest review. I was not compensated in any way and, as always, this review contains my honest opinions. What a great museum. The ship is def something you can't miss in Pigeon Forge. Glad to know it was actually a historical experience - not just a touristry junk place. Didn't realize there was a Titanic museum there. Have been to the one in Nova Scotia. Thanks for the heads up! What an amazing experience, I didn't realise the museum was there. This is fabulous! I would so love love to see this Titanic Museum. Looks like they've done a great job on the activities inside too. Wow, I am daydreaming now. smiles. I live so close... yet have never gotten a chance to visit this museum. I have always loved history about the titanic. My son was even born on the same day titanic sank (years later of course) LOL but this looks sooo exciting. Will have to go see! This attraction is SUCH a neat thing to see! So intense!